You are here: Home / Creative Power / Summer Special! Summertime is a great time to plan your painting strategy for the rest of the year. What’s the most important part of that strategy? It’s having the right project to paint. So what will it be? Landscapes? Still Life? Seascapes? How about making it easy? How about having them all? Until Sunday night at midnight (PDT), we’re making the most fantastic deal we’ve ever offered on our complete collection of art books. That’s right, all twelve books of the “Alexander Art Book Collection” is now on sale. Until Sunday night, we’re selling the entire collection for just $99.00. This is a limited time offer for subscribers to our daily email. This collection contains 112 projects by Bill, Buck, and Lowell. You’ll learn how to paint stunning seascapes, glorious landscape vistas and exquisite still life paintings. 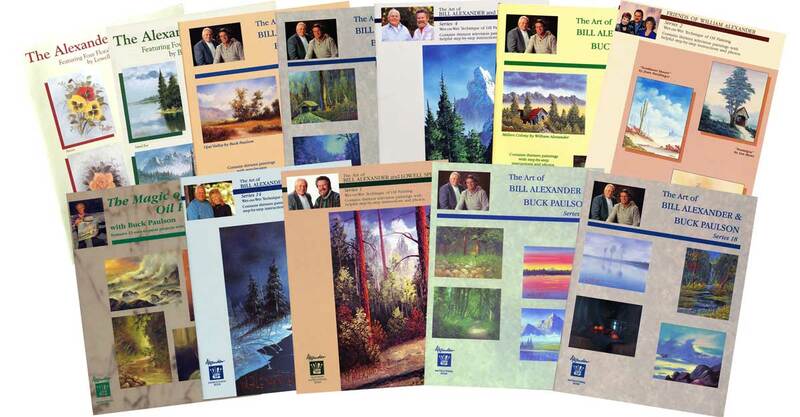 Each book contains 8″ X 10″ full-color reproductions of each painting along with step-by-step written instructions. Many of the projects also include sketches to help you “right-size” your painting so you’ll have the correct perspective. We’ve eliminated all the guesswork. You’ll have projects to keep you busy for months. Each project will help you master the Alexander Method™ so you can paint beautiful artwork effortlessly and fast. We’ve spelled out all the colors and color mixes for you. You won’t need to guess how to create the stunning effects that are the signature of an Alexander painting. Here’s the important thing, though. We do not plan to print more of these books. When they are gone, they are gone. We’ve already had to drop books from the collection because we sold the last ones. Don’t miss this opportunity to create some of the most beautiful paintings ever. Click here to learn more about “The Alexander Collection” and grab your deal today! 112 projects, $99 for everything. Please don’t miss this deal! Click here to grab yours. The clock is ticking.